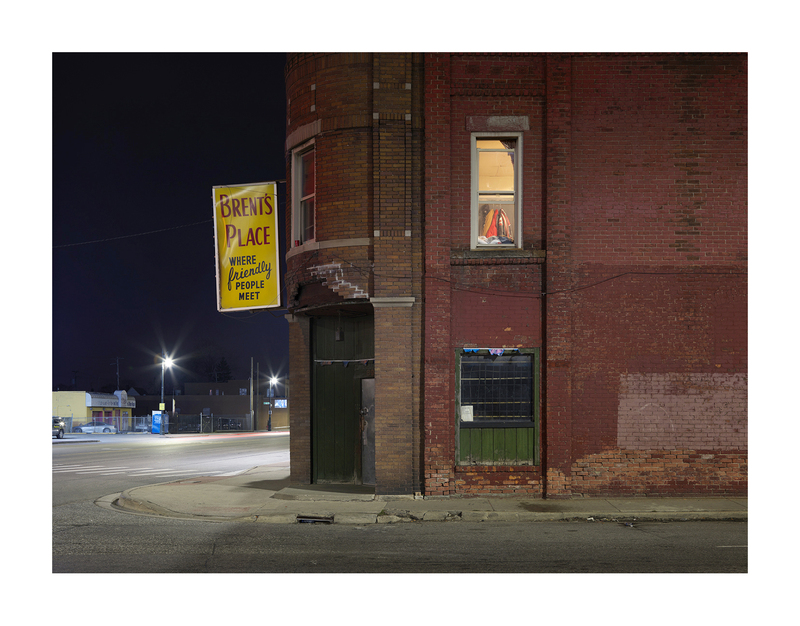 In a continuation of Dave Jordano’s critically-acclaimed Detroit: Unbroken Down (powerHouse Books, 2015) which documented the lives of struggling residents, A Detroit Nocturne is an artist’s book not of people this time, but instead the places within which they live and work: structures, dwellings, and storefronts. 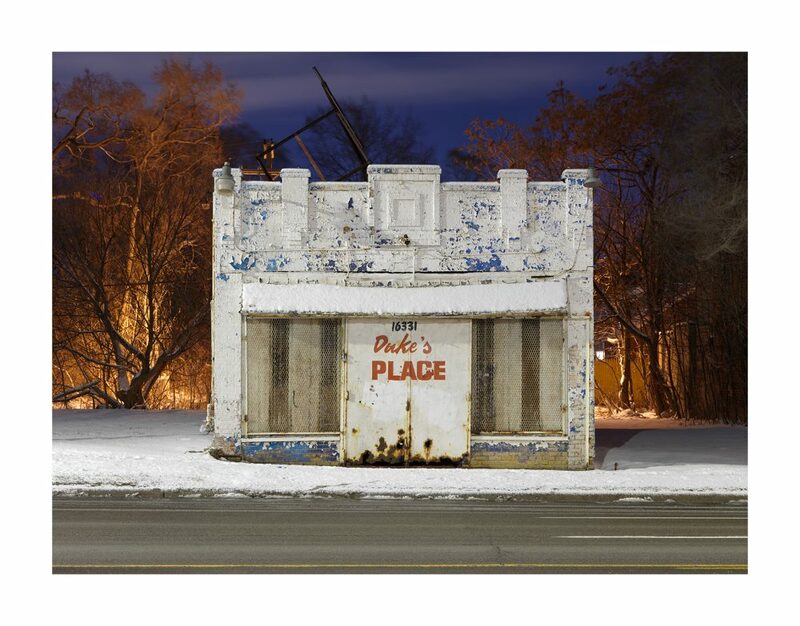 These photographs speak to the quiet resolve of Detroit’s neighborhoods and its stewards, independent shop proprietors and home owners who have survived the long and difficult path of living in a post-industrial city stripped of economic prosperity and opportunity. Jordano’s images show us the framework of a city whose glorious days of growth and energy lie sleeping in the streetlight-painted facades of night clubs, markets, houses, and shuttered buildings. 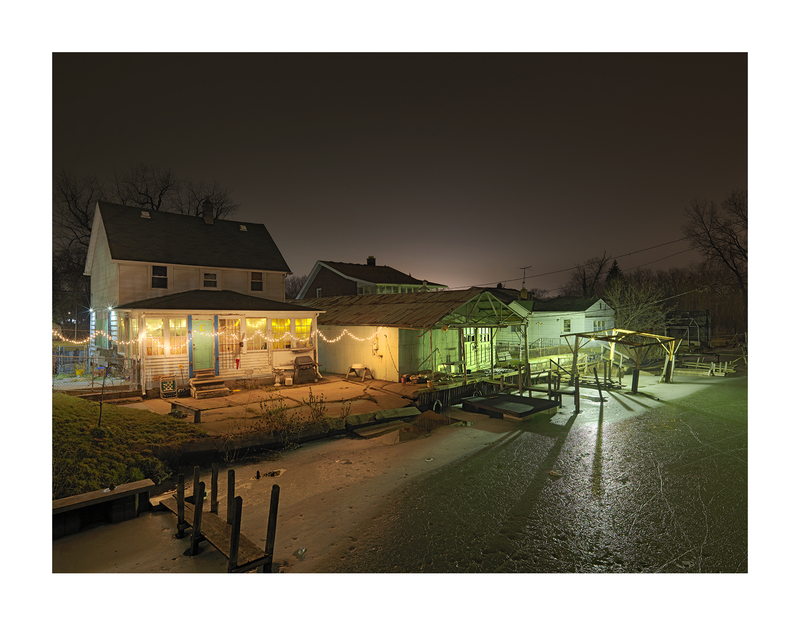 These nocturnal images offer a chance to view the locations in an unfamiliar light and offer a moment of quiet and calm reflection. In many rust-belt cities like Detroit, people’s lives often hang in the balance as neighborhoods support and provide for each other through job creation, ad hoc community involvement, moral and spiritual support, and a well-honed Do-It-Yourself attitude. With all the media attention about Detroit’s rebirth and revival, it is important to note that many neighborhoods throughout the city have managed to survive against the odds for years, relying on local merchants and businesses that operate on a cash only basis who have stuck it out through decades of economic decline. Determination and a strong sense of self-preservation, Detroit’s citizens manage to survive by maintaining a healthy sense of connection without the fear of giving up. All of these places of business and residencies, whether large or small, are in many ways symbols representing the ongoing story that is Detroit, and a testament to the tenacity of those who are trying desperately to hold on to what is left of the social and economic fabric of the city. These photographs speak to that truth without casting an overly sentimental gaze. 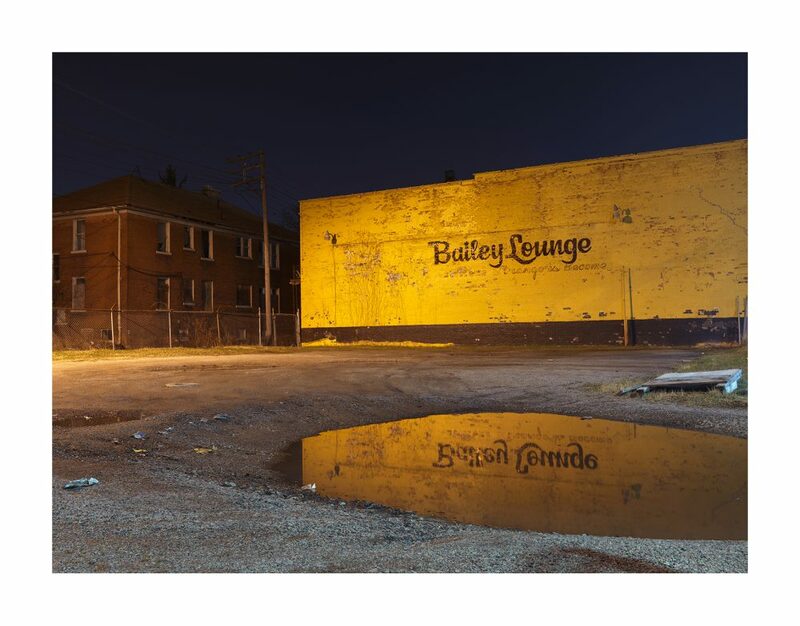 The images of buildings emblazoned with hand-lettered signage, ad hoc lights illuminating their facades, and mixed hues of color cast from street lights might evoke a feeling of Edward Hopper’s images of empty streets, and strong visual contrasts between inhabited environments and their shadowy surroundings. 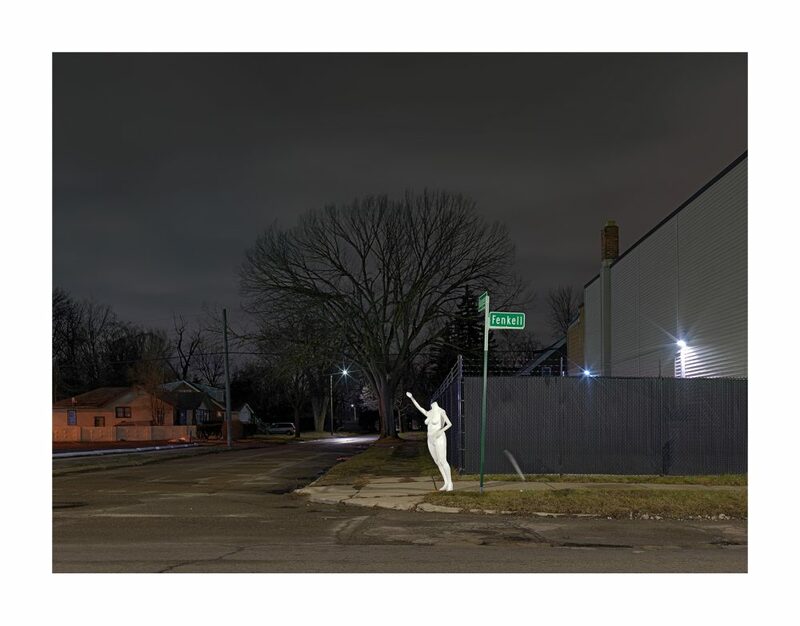 A subset of his images in A Detroit Nocturne all begin with the title ‘Hoop Dreams’ followed by the location of a basketball backboard and hoop. The midwest is riddled with many basketball goals set up in cul-de-sacs, driveways, and practically any space where a pick up game could be played. The absence of any people in these images of basketball hoops, and the inclusion of the word ‘dream’ evokes a feeling of hopelessness and abandonment. Perhaps, the loss of the proverbial American Dream. His chosen locations are often vacant of human activity, and they frequently imply the temporary nature of the life and use of structures we use for a home or business. Prosperity in early phase of a building’s life gives way to dormancy and later abandonment. 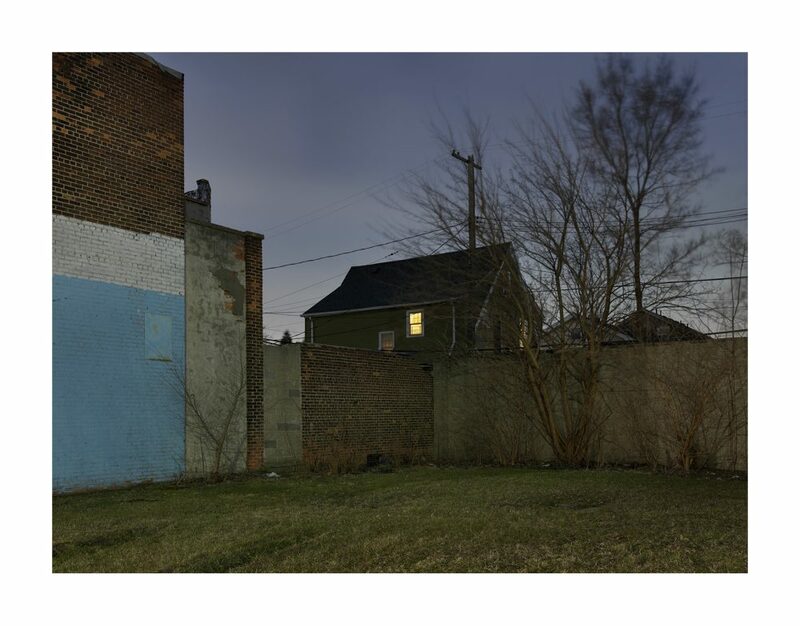 Jordano captures these scenes by using the available light to reveal Detroit’s overlooked neighborhoods in a pitch-black night. 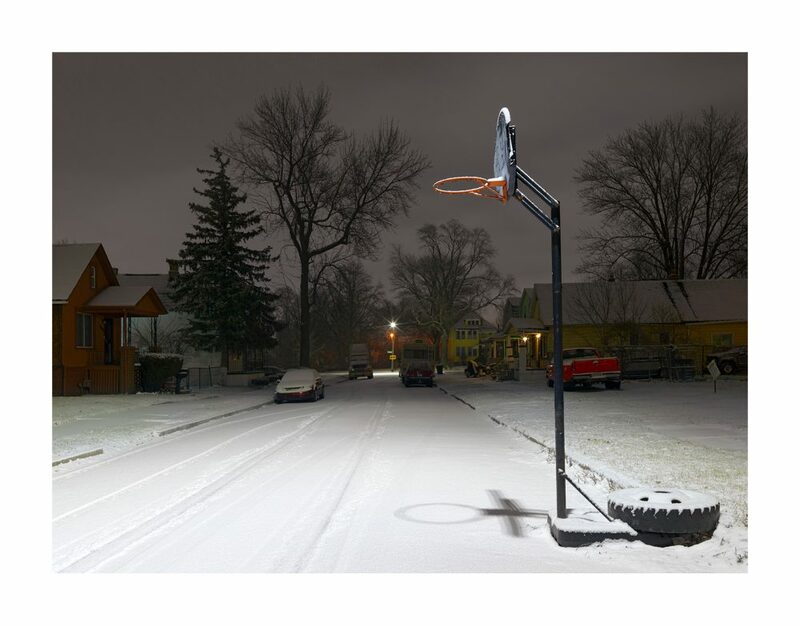 But whether it is a scene with steam rising from underground pipes, a foggy new housing development, or fresh snowfall blanketing a makeshift, side-street basketball court – I was struck by the distinct sense of calm his night scenes bring; and with calm comes hope. 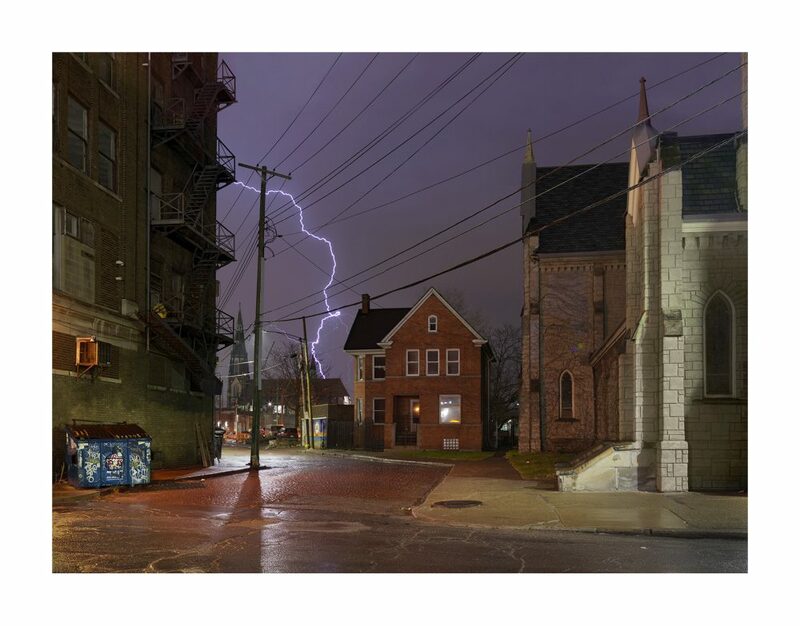 Like the saying: ‘It is always darkest before the dawn’, the resilience and endurance of Detroit, as reflected in its residents and the environment they call home, will surely see their way through this metaphoric night. All images used with permission. 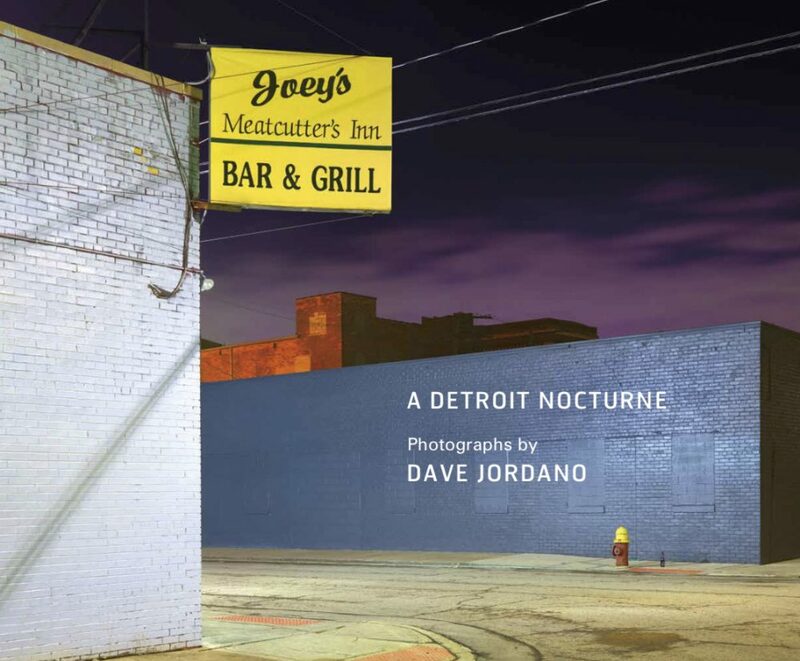 From A Detroit Nocturne by Dave Jordano published by powerHouse Books. Dave Jordano was born in Detroit, Michigan in 1948. He received a BFA in photography from the College for Creative Studies in 1974. In 1977 he established a successful commercial photography studio in Chicago, shooting major print campaigns for national advertising agencies. Jordano is the author of Detroit: Unbroken Down (powerHouse Books, 2015) and has exhibited nationally and internationally and his work is included in the permanent collection of several private, corporate, and museum institutions, most notably the Museum of Contemporary Photography, Chicago; the Museum of Fine Arts Boston; the Museum of Fine Arts Houston; the Detroit Institute of Arts; the Detroit Historical Museum; The Mary & Leigh Block Museum of Art at Northwestern University, Evanston; Library of Congress, Division of Prints and Photographs; the Harris Bank Collection; and the Federal Reserve Bank. Karen Irvine is Curator and Associate Director of the Museum of Contemporary Photography at Columbia College Chicago. She has organized over forty five exhibitions of contemporary photography, at the MoCP and numerous other venues.